Sunscreen or eczema – Sunscreen helps protect his skin, but irritates it too and causes more eczema. Sunlight seems to improve his skin, so keeping him covered and out of the sun isn’t perfect either. Plus, covered skin in heat means sweat, which means eczema! 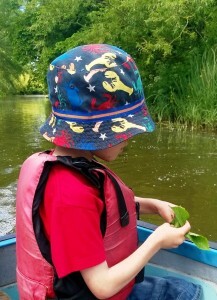 Sun hat or not – Usually this is a no-brainer and MyItchyBoy is great at wearing a hat in winter or summer. This week though, we’ve ended up with him on antibiotics as he was itchy on the rim of his sun hat and managed to scratch it enough to cause infection. Tumble dryer or washing line – The cost of the tumble dryer running when there is plenty of lovely warm sun outside is something I try not to think about. However, to reduce the amount of pollen on MyItchyBoy’s clothes and bedding, we are committing to tumbling all his stuff. Bedroom window open or closed – Fresh air and keeping cool at night or pollen coming in the window? Pyjamas or naked child – Pyjamas help to stop access to skin, but they also make him warmer, which leads to itchiness. What dilemmas do you have dealing with eczema in summer?